National Chicken Lady Day is in honor of Dr. Marthenia "Tina" Dupree. 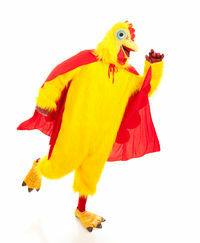 Dr. Dupree worked for 12 years for the second largest chicken restaurant in the world. She held one of the highest level positions in the company, Director of Community Relations and Training. Due to her work with the community she became known as "The Chicken Lady." For her community involvement and efforts to raise educational standards, she was invited to meet President Bush in 2001. In honor of her efforts, it was said that President Bush proclaimed November 4th as National Chicken Lady Day. In spite of finding some information indicating that President Bush did not officially declare November 4th as a national holiday, the lore of that meeting did spawn the celebration and recognition of this day. This page was last modified on 18 September 2013, at 09:13.